Chuckchi Sea through Bering Sea and Aleutian Islands to central California, and to Okhotsk and Japan seas primarily in waters over the continental shelf. Broadcast spawning occurs early spring; their eggs are pelagic and drift slowly upward, hatching in 2-3 weeks; larval pollock feed on plankton for around 6 months before settling toward bottom. They form single age cohort schools in the wild. 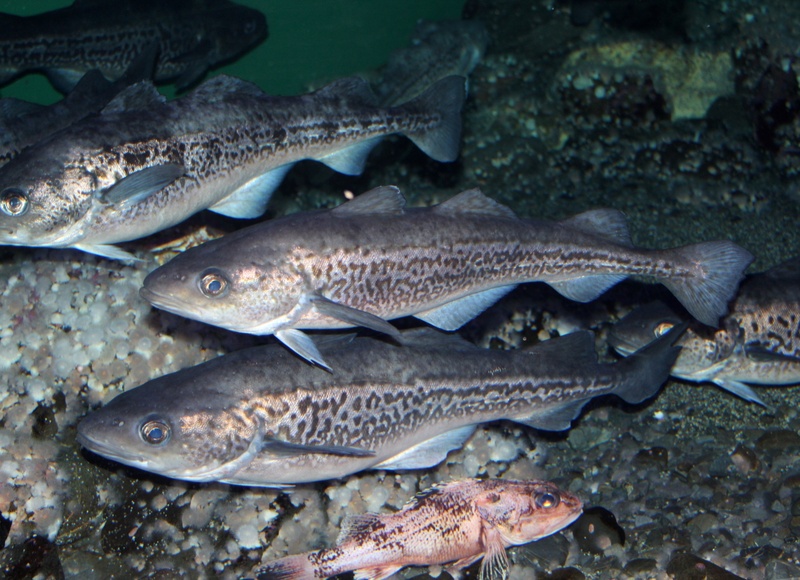 Pollock become reproductive at age 2 and may live up to 20+ years. National Marine Fisheries Service has determined that pollock are not overfished. However, stock abundance is now at a lower level than twenty years ago and management of the fishery has required establishing reduced harvest targets in response. Central Bering Sea pollock populations saw a dramatic decline in the early 1990s and despite a 1994 international convention prohibiting commercial fishing in those waters, numbers have not recovered. These fish make diurnal (daily) vertical migrations to forage. Pollock are processed into surimi, a product which is used to make imitation crab, lobster and other seafood products. Pollock fillets become the “fish sticks” and “fish fillets” familiar to many consumers.